Rumble Roller benefits can be seen in just a few short weeks. Those of us who run and train on the Florida beach find this deep tissue massage modality extremely therapeutic. We love running on the beautiful Florida Gulf Beaches here in Paradise, but like at any other location, commitment to regular exercise comes with mild injuries, muscle pulls, and bouts of connective tissue inflammation. We have made the use of foam roller massage a daily part of our pre-workout and post-workout routine, but for those of us who invested in the Rumble Roller, the benefits exploded. I am bothered by hamstring origin/insertion tendinitis. Running too many intervals up John's Pass Bridge created some severe inflammation in my "Sits Bones", and really slowed me down, last year. The Rumble Roller takes myofascial self release and deep tissue massage to an entirely different level. This 31"x 6" foam roller is cutting edge when it comes to trigger point massage. It breaks down knots, it stretches muscle and connective tissue in multiple directions, it helps increase flexibility, and best of all...the Rumble Roller reduces pain. As you can see, it's surface is saturated with specially designed uniform bumps that manipulate soft tissue, stimulate trigger points, yet deflect out of the way when they contact a bony structure. You can easily control and reduce contact to specific body parts with just some subtle shifting. I was surprised at how comfortable it felt along my spine. I have been overwhelmed with how easily it has restored flexibility to my high-hamstring area, and how quickly it has brought relief to the pain. You can easily roll out tightness in your back, glutes, hamstrings, and calves. I have two friends that use it exclusively to treat IllioTibial Band Syndrome, from running on the sloped shoreline, and they swear by it. The Rumble Roller is also becoming the "go-to" foam roller for CrossFit athletes. It comes up more and more in the conversation at my CrossFit gym in St Pete. 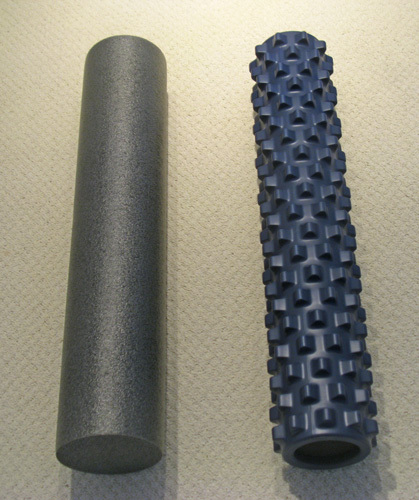 As you can see, there is a huge difference between the Rumble Roller and a traditional foam roller massage modality. It will take some getting used to, and I advise starting with the traditional one for 30-60 days. Also, women may be taken back by the aggressive feel of the Rumble Roller when they first experience it since their tissue seems more sensitive. Women might want to start with wearing sweats their first few times, then go with just a t-shirt. Guys, like me, with hairy legs may experience a few pulled follicles, but you will learn to deal with it. It stays clean and does not breakdown like regular foam rollers. The Rumble Roller comes in two different densities. The blue one is a little softer than the black model. Although I did not know this when I purchased mine from Amazon.com, I have no complaints. Mine has worked perfectly in terms of significantly reducing pain from my hamstring tendinitis. You will have to be the judge for your own purchase, although I see almost all blue ones at different CrossFit gyms. It doesn't seem to be an issue with these athletes. As you can see, from this instructive video, Rumble Roller benefits are being seen in big gyms, not just from home use.